It was an exciting year for Vancouver, B.C.-based Gray Line West in 2006. First, the operation instituted a rebranding of the entire fleet, which includes operations in Victoria, B.C., and Banff, Alberta, complete with new paint and decals featuring its new Gray Line West moniker — an effort to set itself apart in western Canada. “The Gray Line operation we purchased here in Vancouver was originally owned by Greyhound, so we wanted to try to distinctly separate Gray Line from Greyhound,” explains Ian Robertson, director of sustainable development for the Armstrong Group, parent company of Gray Line. An additional rebranding effort included the purchase of five new DaimlerChrysler-branded Setra S417 coaches, as well as a fleet of British-style open-top double-decker buses launched last year in Victoria. “The [vehicles] have really helped to differentiate us from the competition. 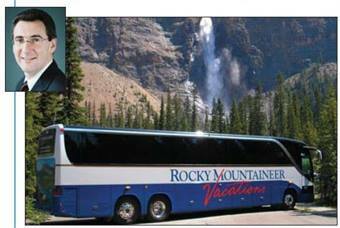 We really want to set ourselves apart as a sightseeing tour and charter bus company,” Robertson says. Gray Line has also partnered with the Whistler Mountaineer luxury train service. The partnership involves picking up passengers from hotels and taking them to the train station for boarding. The new coaches, which have been a hit with customers, are also equipped with a front-mounted camera that captures the view from the road, which can then be seen by passengers on five 15inch monitors positioned throughout the cabin. The investment in the new vehicles has been well worth it as the Whistler Mountaineer trips are fast becoming a key tour. “I think it’s one of the most beautiful journeys in western North America. You start off right by the ocean and you travel up mountain ranges that are on either side of the road,” says Robertson. Gray Line also partnered with Whistler Mountaineer’s sister train — the Rocky Mountaineer — as well as other tourist attractions throughout British Columbia and Alberta to increase business. Another business-boosting initiative undertaken by the company included a promotion to help deal with the decline of tourists visiting Canada from the U.S. Last Fourth of July, the company offered all Americans visiting Vancouver free admission to its “hop-on, hop-off” tour aboard double-decker buses that stop at 20 of the city’s top attractions. Robertson explains that those same double-deckers have also helped set Gray Line apart from the competition in the cruise line industry in Victoria, where 125 cruise ships come into town annually. To enhance the operation’s focus on customer service, it has doubled the number of passenger pickup and drop-off points. Additionally, it turned the Rocky Mountaineer train station into a central drop-off point where guests can enjoy complimentary coffee and muffins while they wait for their sightseeing bus to depart. Keeping with that same focus on the customer, Gray Line also introduced a concierge service on its popular Vancouver-to-Victoria sightseeing tour. Service area: British Columbia, Alberta, Canada and U.S.